"We may be outraged, but we're not surprised." 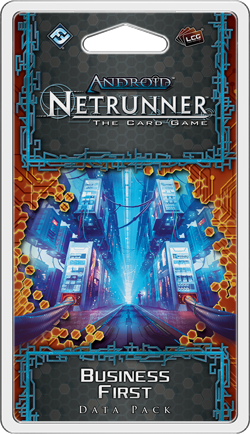 Fantasy Flight Games is proud to announce the upcoming release of Business First, the second Data Pack in the Mumbad Cycle for Android: Netrunner! 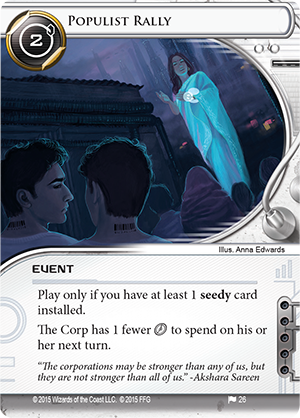 In the future of Android: Netrunner, the world's economy relies heavily upon the cheap labor provided by andoids. 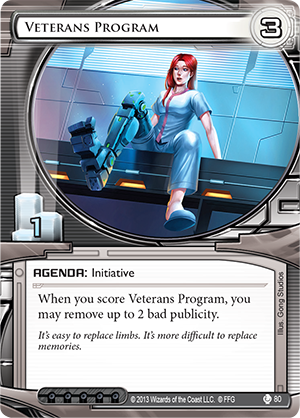 These include the artificially intelligent bioroids manufactured by megacorp Haas-Bioroid and the millions of genetically customized clones grown and distributed by Jinteki. Their labors have helped control the prices on all manner of goods and services, from agriculture and textiles to the tech industry and solar exploration. They have also made Haas-Bioroid and Jinteki two of the world's richest and most powerful organizations. Now, in the Mumbad Cycle, Jinteki faces a looming crisis as clone rights have become a central point in the Indian Union's national elections. Business First introduces sixty new cards (including a full playset each of nineteen different cards) that explore the tensions and conflicts within this tumultuous environment. 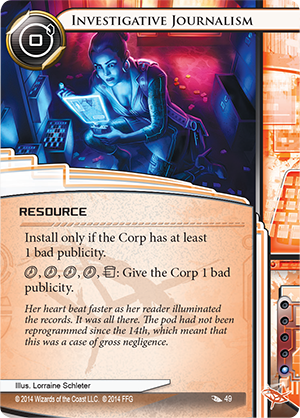 As the horror stories about the treatment of Jinteki's clones begin to emerge, you'll find the Corp's public relations division drawing attention to its work with sustainable foods. 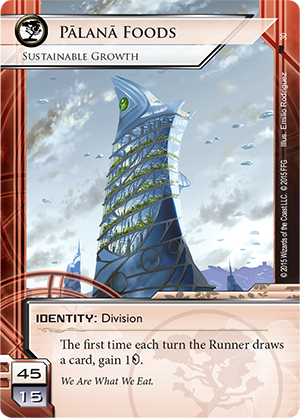 And as it seeks to capitalize upon the scrutiny directed toward Jinteki, you'll find Haas-Bioroid showcasing its advanced assembly lines and smartfabrics. 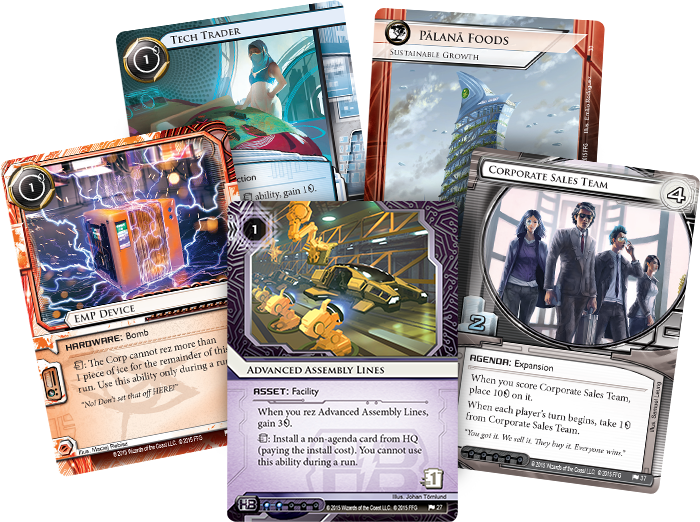 However, the question of clone rights doesn't end with the Corps, and you'll find new cards for each of the game's seven factions. Naturally, their responses to the situation at hand vary as wildly as their motivations, and you'll find bomb threats, elaborate raids, and populist rallies. 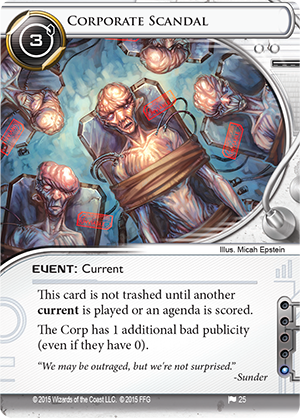 What will result from the Indian Union's exploration of clone rights and Jinteki's Business First mentality? Will the clones be granted citizenship? 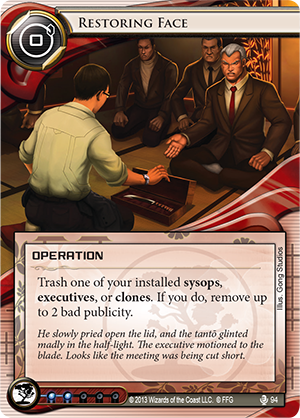 Or will Corporate sales teams help Jinteki successfully rebrand their efforts and lead everyone back to business as usual? 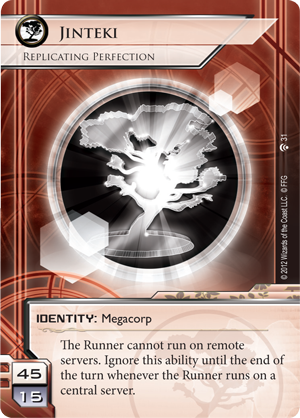 As the Indian Union more closely explores the issue of clone rights, Jinteki's rivals do all they can to capitalize upon the biogenetics giant's defensive stance. Some seek to promote their own wares and services. Others go dirty, buying Runners to dig up and expose negative archival footage. Corporate Scandal (Business First, 25) appears as a neutral Runner current in Business First, but it would surprise no one if the scandal were discovered in response to a tip-off by one of Jinteki's corporate rivals. After all, that's the way you play the game: whether Jinteki loses to a Runner or to a rival business, the point is that Jinteki loses. Mechanically, Corporate Scandal creates a point of bad publicity that stacks with any bad publicity the Corp has already taken, but this point of bad publicity can't be removed by cards like Restoring Face (Fear and Loathing, 94) or Veterans Program (True Colors, 80). It can only be removed if the Corp manages to deflect the public's attention by playing a current of its own or by scoring an agenda. This means that Corporate Scandal is an excellent trigger for cards like Investigative Journalism (Order and Chaos, 49) and Blackmail (Fear and Loathing, 89). Of course, it also provides Runners with all the standard benefits of bad publicity. It's a recurring credit that can be used each run, whether to pay for icebreakers, install programs from a Personal Workshop (Personal Workshop, 49), avoid traces, or trash cards that you access. 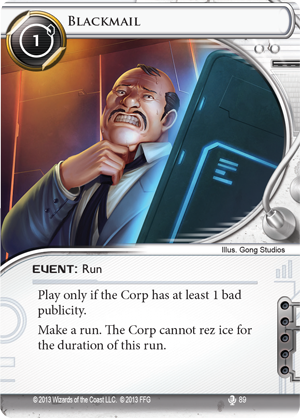 And because the credits you gain from a Corp's bad publicity are refreshed each time you run, they pay greater dividends the more you run, meaning they're particularly useful against a Corp like Jinteki, whose shell games and powerful identity, Replicating Perfection (Trace Amount, 31), may force you to run multiple times before you find a valuable target. In other words, if you're a Runner who plans to run against a Corp, exposing that Corp's dirty secrets in such a way as to lead to a Corporate Scandal is a solid first step. And then to keep that bad publicity in place, you might even try to limit the Corp's available clicks and options by holding a Populist Rally (Business First, 26). "We can help others, yet also help ourselves." At the end of the Corporate workday, it's all about the bottom line. So even as the Mumbad Cycle and Business First thrust Jinteki face-first into the middle of a very delicate and politically charged situation, you'll find the Corp and its executives lining up to face the challenges before them, quickly and professionally. Every challenge is an opportunity, after all, and fans of Jinteki will be rewarded for their faith with a new identity, asset, and piece of ice. 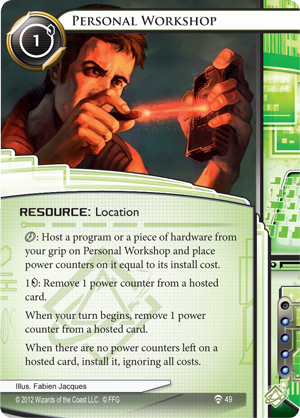 Can you use the scrutiny directed toward Jinteki to gain an advantage over the Corp? Or will you help Jinteki cleverly turn it into positive attention, focusing not on clone rights, but taking the name "Jinteki" and associating it with Palana Foods (Business First, 30) and sustainable agriculture? The Indian Union's national elections have led the nation toward a point of crisis. Things are bound to change, but who will drive those changes? Business First is scheduled to arrive at retailers in the fourth quarter of 2015!